The Bridge Short Stay School | Packington Free Range | Born and reared outdoors. Always. In September, we donated two of our pigs along with feed, straw, a feed trough and drinkers to a fantastic initiative at the Bridge Short Stay School in Lichfield. Through their work with the pigs, which includes checking they have enough feed and water, changing bedding and maintaining the upkeep of the pens and generally considering the animals’ welfare, the students are able to work towards a BTEC qualification in subjects such as animal care. Animal welfare is at the heart of everything we do and caring for the pigs is a fantastic way to encourage the next generation to question where their food has come from and how it was produced. Looking after the animals also helps to instil a real sense of pride and responsibility, and if the children can take this away from the experience, it is something we are incredibly proud to support. 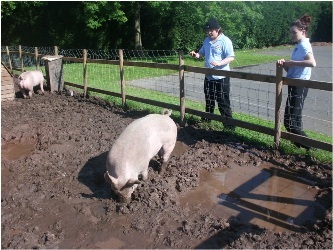 So far the programme has been a great success and the school plans to welcome two more of our pigs in September.